When I cut into a lemon I can’t help but give it a good sniff. It’s the same with lime and grapefruit. There’s something about that citrus smell that I just can’t wait to inhale; especially if it’s a drizzly day. I also love tropical flavours at this time of year: coconut, passion fruit, mango, you name it! Combining a bit of citrus and a bit of tropical was the idea here so I set about baking some lemon and coconut flapjacks. Preheat an oven to 180C and grease a baking dish well, the one I used was 20cm x 20cm. In a small saucepan melt together the butter, brown sugar and golden syrup on a low heat. Stir often to ensure everything gets well combined. Stir the oats, coconut and lemon zest together in a large bowl. Once the butter, sugar and syrup have melted pour them into the oats and mix everything together well to ensure that the butter mix has coated everything. Tip the oats into the baking dish and flatten the top with the back of a spoon. Remove the flapjacks from the oven and mark into portions while they are still hot. Leave to cool for at least 20 minutes before removing and leaving to cool on a wire rack. To make the icing squeeze the lemon juice into a bowl. Sift in three tbsp icing sugar to start with and see how thick the icing gets. Keep adding more icing sugar until the icing becomes thick enough to coat the back of a spoon. 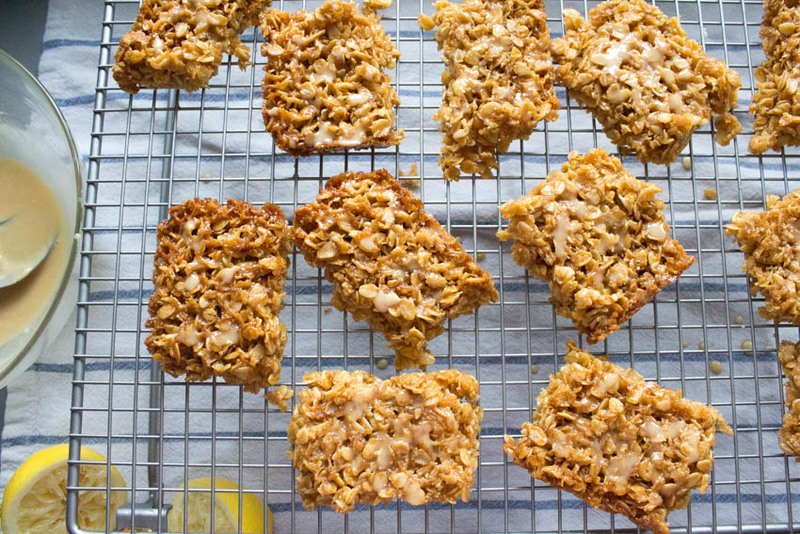 Drizzle, splat or dunk the flapjacks in the icing to decorate. Now when you come to ice the flapjacks don’t be alarmed that the icing dribbles down in between the oats. That tangy lemon hit will settle somewhere inside and be delicious when you come to eat it. By using unrefined icing sugar the icing will come out a pale brown/yellow colour but if you use refined icing sugar it will come out white. 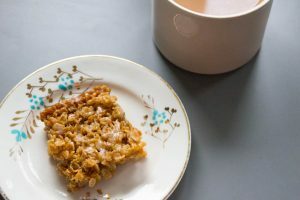 I really like using chunky whole oats for flapjacks as I think it gives a great texture and mixed with coconut the overall texture of these is slightly chewy at the edges and soft in the middle. Just how I like them. Are flapjacks same as granola bars? Why are they caleld flapjacks? They look crunchy, yet chewy…a perfect afternoon pick-me-up or breakfast on the go. They are similar, but a standard flapjack is made from just oats and butter/sugar/syrup mix, then you can add extra ingredients if you want to. Boy, do these sound amazing!! A healthier sweet treat to soothe my cravings!! Interesting that in American English they call these English Flapjacks and American flapjacks are pancakes and here in Sweden what we call pancakes is a crepe. It’s fun to compare food names. The English flapjacks I’ve had were thick like a brownie. I like the flavor and crunch yours must have. I didn’t know there was such difference between them! Really interesting the different names we all have for food. Wow – this is something I never knew! Like Ron, I know flapjacks as pancakes. These sound wonderful, and – I am with you – the fresh scent of lemon (or any citrus) is just pure heaven! Caroline – I love flapjacks! I first made them years ago with a recipe in Bon Appetit, but I love this variation – I can’t wait to make these, I love a quick and easy treat! I have heard of flapjacks before but never realized this is what they were! These sound good! nothing like some sweet icing hidden in all the nooks and crannies! these sound delicious! 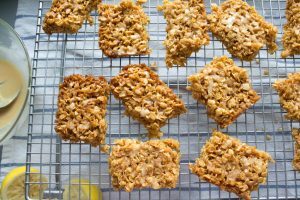 I initially had the same reaction as some of the other ‘commenters’- these look more like granola bars than American-style flapjacks. But whatever you call them, they sure do look delicious and chewy! Love lemon and coconut! These look wonderful — bet the flavor is so good and satisfying. Thanks! I thought a flapjack was a pancake, please pardon my Australian ignorance. This looks wonderful and healthy and I love the addition of lemon for a bit of zip. Not at all! Apparently a flapjack is a pancake depending on where you’re from, who knew there were so many names for all these things?! I haven’t had a lemon flapjack before, but like you, I adore citrus flavours so I am positive I would love these.